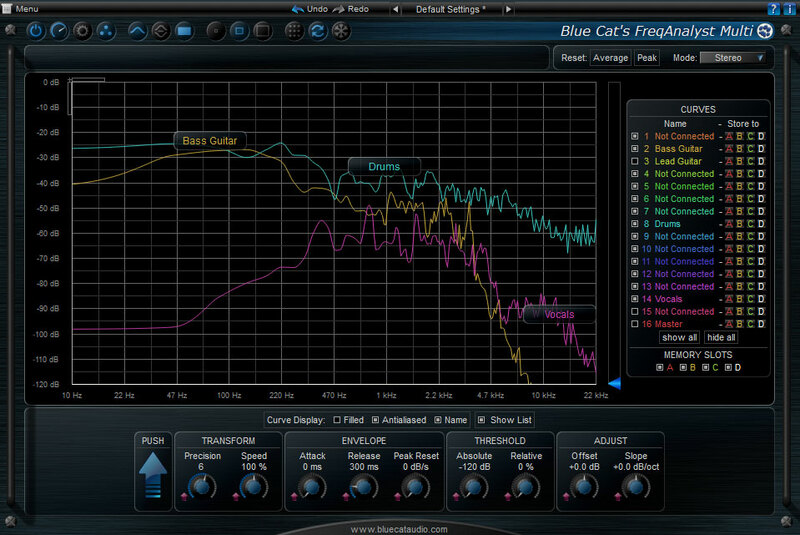 Blue Cat is a music software company from France and run by a gentleman name Guillaume Jeulin. The first thing that strikes you about this man is that he is so different. OK, everyone is different, but he thinks different, his brain is different – very different. Some of his plugins are so uniquely cool you ask yourself – why hasn’t anyone done this before? 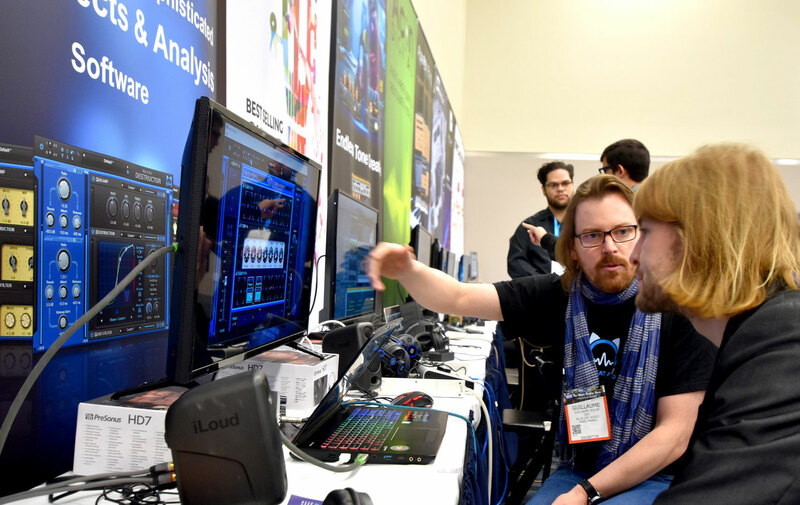 For example, his plugin called FreqAnalyst Multi can be inserted on several audio tracks at once and set to send the spectrum of that track to the display in one of 16 selectable colors. Once insert across the channels, you can then open any instance and view all the spectral curves together with each channel represented by its very own separate color! That is so valuable when you are mixing you have to wonder why all spectral tools do not work like this. 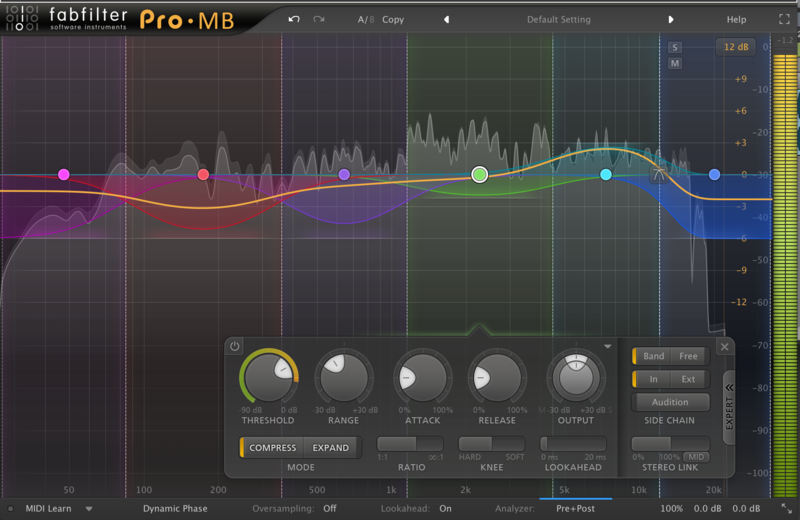 It’s one of the best ways to see how your tracks line up together and against each other across the spectrum. Even though this plugin has been out for years, it remains the only one of its kind. 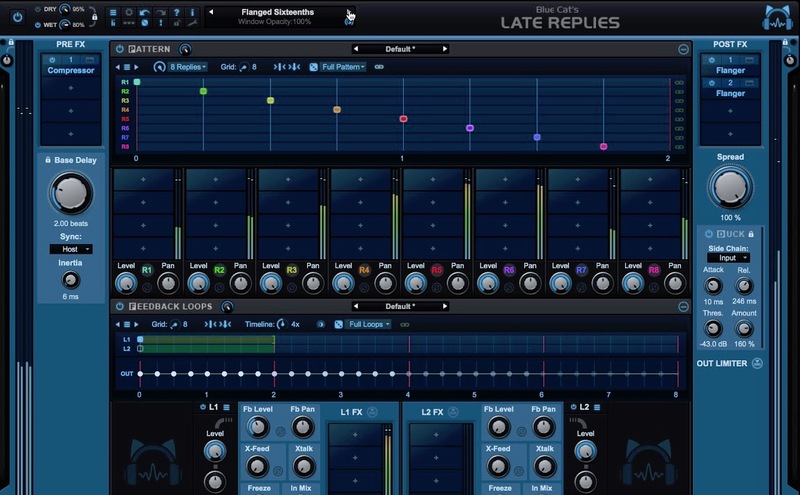 Guillaume has now jumped into the Delay market with his first delay plugin called Late Replies – an 8-tap, MultiFX Delay Workstation that can load VST plugins inside itself. The first question I always ask is why – why make another Delay plugin in a world awash in Delay plugins? What does Late Replies contribute to the Delay universe? Well, I can say, it contributes a lot. In my humble opinion, it is the most advanced and most powerful delay unit ever built. 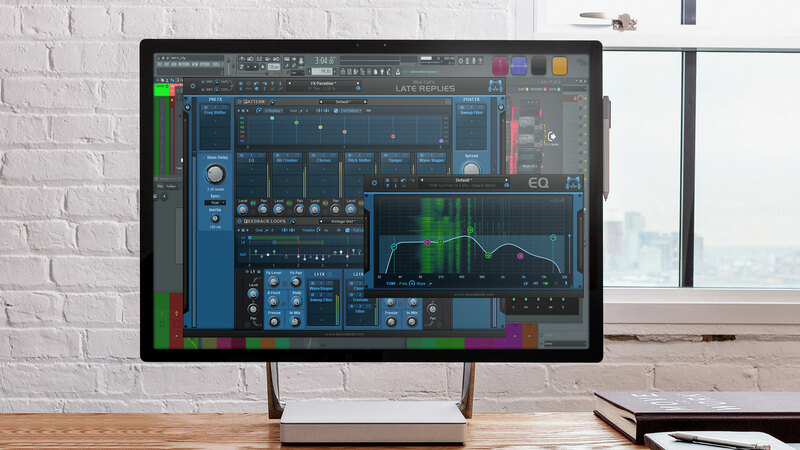 There is a reason I am using the word Delay Workstation rather than Delay plugin because this is really a platform for building an effect that can be very sophisticated – strong emphasis on very. As you can see from the diagram below the signal comes in at the left and flows upward into the Pattern section, then down through the Feedback area and out to the Post FX section. Imagine for a minute a vocal signal entering a delay. However, before it even enters the core delay system, it is processed by one of the 35 built-in effect residing in the plugin. Effects in the plugin? Well, yes, this plugin has an array of highly useful Effects that can be used throughout the various sections. 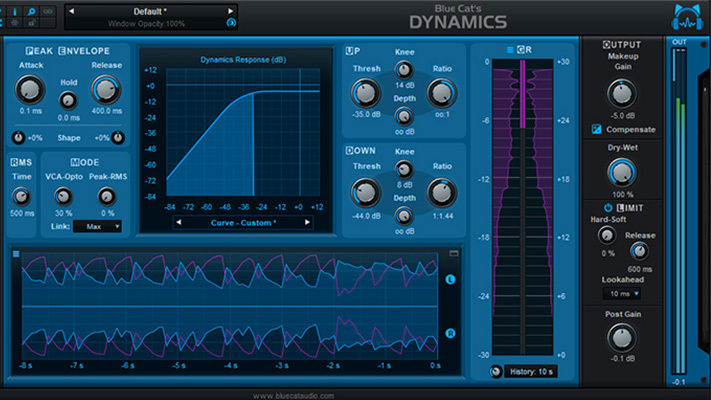 These effects include gates, compressors, distortion, reverb, modulations, and yes, even delays. So you can process the signal on its way in. But not just with a single effect – you have 4 of them that can be lathered on the signal. That’s a Blue Cat exclusive! This is what I mean when I say Guillaume thinks differently. As if that wasn’t enough, you can load VST plugins into these 4 slots. 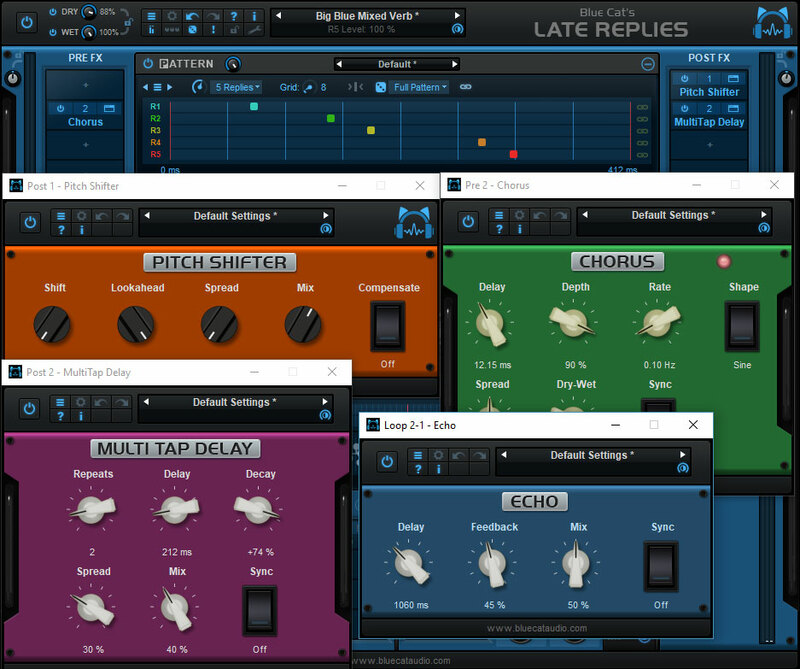 So if you have your favorite “must-have” effects plugins from Blue Cat or other companies, you can load them in here – yes, 4 of them in sequence – and yes, you haven’t even hit the Late Replies Delay core yet. This pre-processing is very useful for directing the delay to certain parts of the spectrum. You can also use it to beef-up a signal or clean up unwanted noise. You can also use this to control the dynamics of the signal. So it a live situation or one where you cannot labor over the signal coming in, having this much control of what hits the delay is extremely useful. 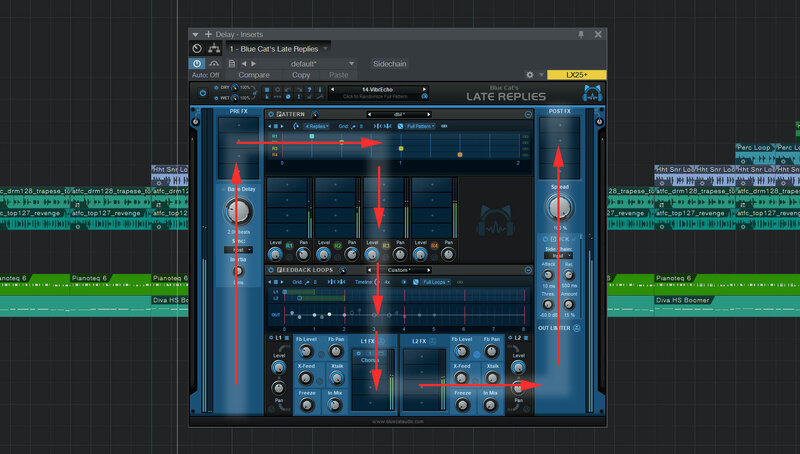 If you are thinking what I am thinking – yes, if you are running Logic or Pro Tools, you can load the Late Replies and load your VST’s into it. This effectively makes all your VST’s usable with AU and AAX hosts like Logic and Pro Tools. Once you are through the input section, the next stage of Late Replies is the Pattern Designer. Here you can create the sound of the delay by setting the time of up to 8 different delay taps. Each is displayed on a grid that stretches effectively for 2 bars. You can lock taps to the mathematically rhythmic grid, move then off the grid by hand, or even Shuffle/Swing them – love having this. The built-in Pitch Shifter FX can be used to make taps that form chords. By storing presets you can make delays that follow the musical direction of the song. There are a number of chord-type delay presets which are especially glorious on rhythmic parts. This is a great area to dig in and mine for unique and interesting sounds, even if you just stick to octaves and fifths. Having 8 taps is a lot to manage. I found a great way to work was to start working with two taps and increase the number of taps gradually up to the degree of echoing you can take. The results have been some hypnotizing moments. This is one of the best delay pattern interfaces out there, if not the best. Why do I say this? It is intuitive and it invites you to play. It is also malleable so you can’t mess anything up as you can quickly turn each tap ON or OFF with the wave of a mouse. The Patters section has its own set of presets - 42 total. The sonic range is quite startling from family-friendly echoes, to convincing reverbs, to hell-like canyons that bounce the signal from here to kingdom come, to noise-quaking soundscapes that I would only use if scoring a horror flick. One of the first things you should do is just step through the many presets with a vocal and just listen. When you find something that is appealing, begin to modify it and then save it as a new preset. Remember there is a Global Preset for the whole Delay Workstation, but you can also save these section settings as their own mini-preset for recall into the Global settings of Late Replies as a whole in another time. This allows you to make customized patterns that can be recalled and interchanged without affecting other parts of the plugin. Figure 8. Pitch-based delays are easy to construct. OK, follow me here because it is getting juicier. Each of the 8 taps has its own pan and volume etc., which is expected in today’s world. 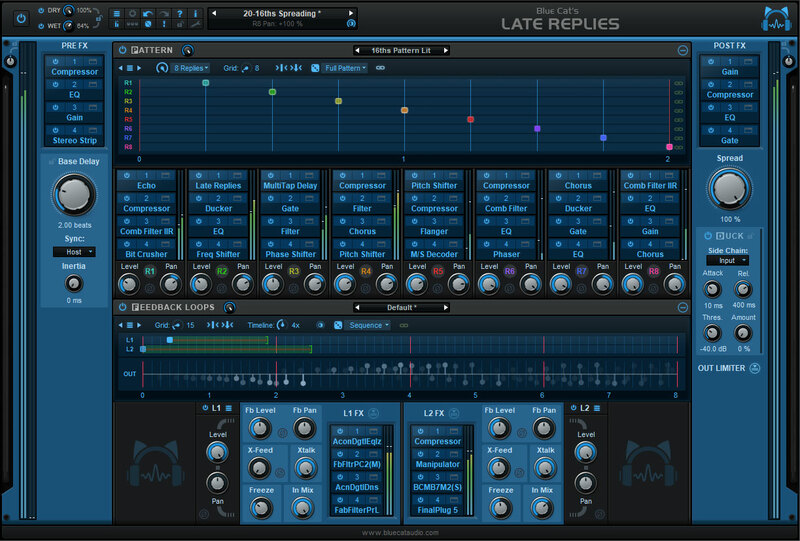 However, where this plugin takes off to Mars is when you see that each tap can have 4 plugin effects assigned to it. Yes, so in addition to the 4 on the input, each of the 8 taps can have 4 independent plugin chains assigned to them. So that’s 8 x 4 or 32 possible effects on the taps. OK, the question becomes who needs this much tweakopedic complexity. Well, it depends on where you sit. For me, this level of complexity is the equivalent of what you do on a console to a sound. 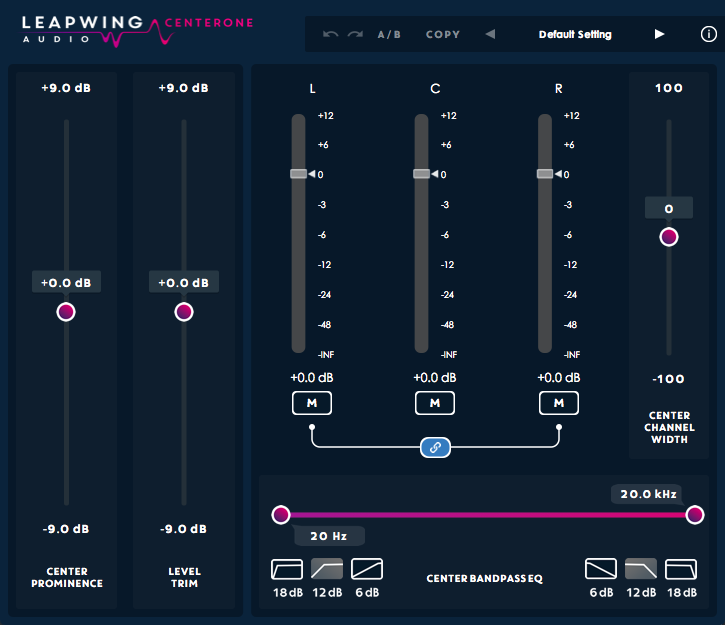 You can completely tailor your vocal or guitar in this single plugin with the utmost depth. 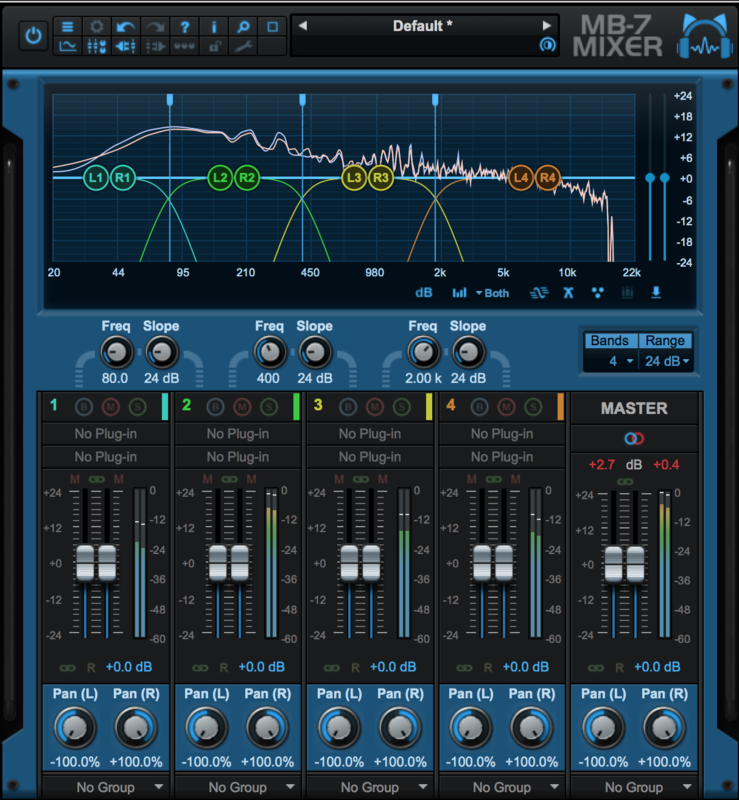 Now, you may ask the natural follow up – why would I just not use my mixer? Well, the obvious answer is for collaboration and recall, it’s easier to transport your sound with recalling a preset rather than hope to recreate the mixer in your DAW on another system, in another place or in another DAW. For example, if you have a special vocal chain that gives you that certain silky vocal sound, create it in Late Replies and store it. If you buddy also has Late Replies and another DAW, it doesn’t matter. As long as he has the same plugins, you are set. We have to remember that if you are going to work on 10 songs and have to setup up the vocal chain 10 different times in the DAW’s mixer, that may be fine, but it sure would be nice to recover some time spent setting up by being able to easily reuse the result of that sweat. 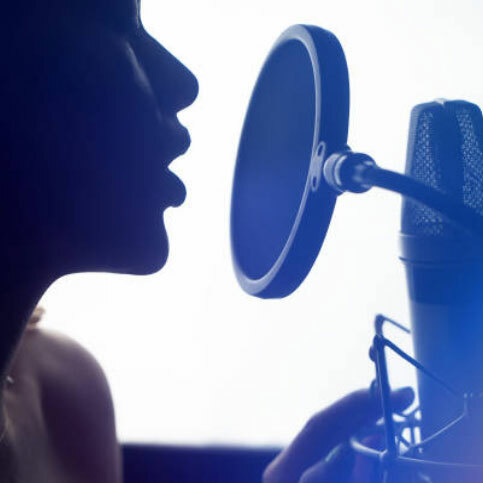 To start from scratch every time to build that perfect vocal sound is not necessarily something that can be done in a short time. 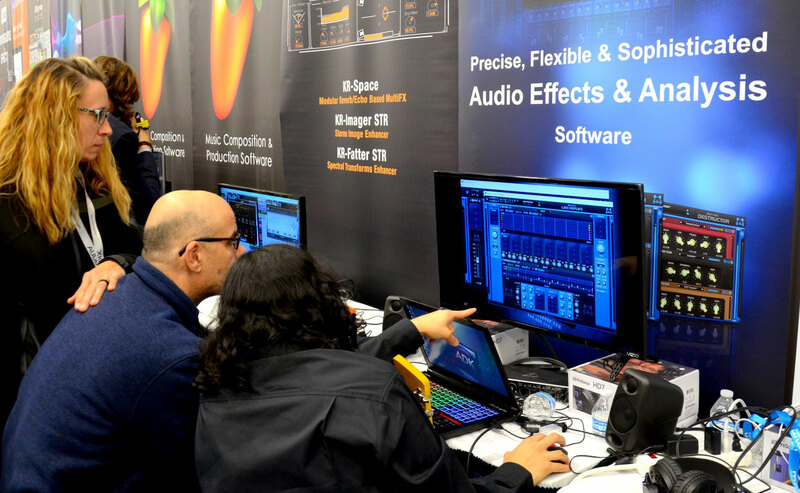 And being able to migrate the sound between DAW’s – well that is heaven. 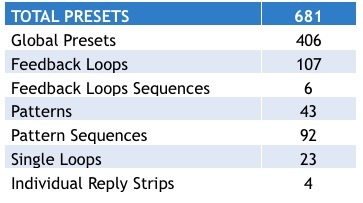 Another huge use of Late Replies is as a VST Host for AU or AAX hosts. You can load Late Replies as an AAX plugin in Pro Tools for example, and then load VST plugins into it and therefore use them in Pro Tools to process audio. 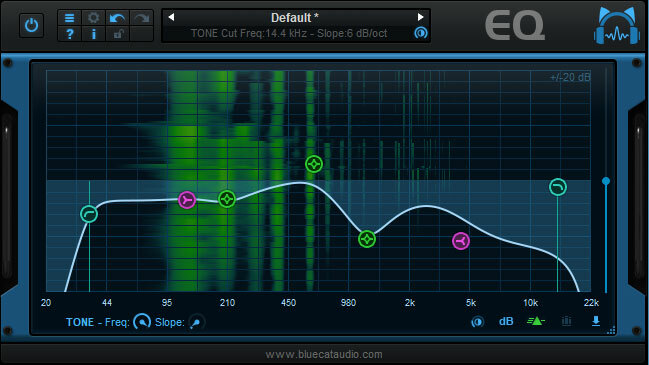 It must be said that Blue Cat makes the most popular VST Host plugin called Patchwork. This sells for $99.00 and is worth every penny. The Delay Pattern empties out into the Feedback Loops section where you can graphically arrange for 2 independent feedback loops using a pair of range parameters that can freely be extended and shifted along a time range measured in milliseconds of the meter – up to 8 bars here. 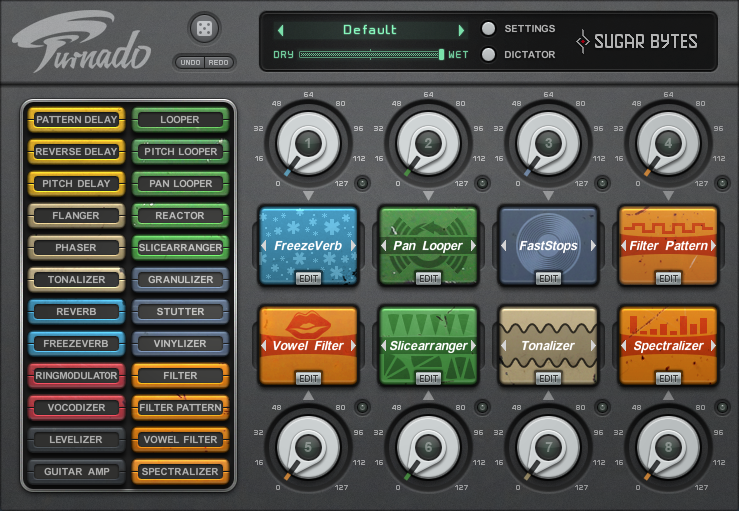 This again is where this plugin departs from all others as not only can you slip and slide the feedback loop to exactly what you want, but the behavior of each loop is managed by 8 knobs – level, pan, crossfeed, crosstalk, freeze, and parameters along the top for grid size and time range stretching for 8 bars instead of 2. There is a rather sublime interface that visualizes the feedback in a most intelligent way. For example, you can see how the two feedback loops interweave not just in the time domain but on the stereo plane also. The density of the color shows the relative strength of the feedback at that point in time. Again, I want to stress that the interface itself, being so beautiful, invites you to invent, experiment, tinker and discover. Try experimenting with vocal, guitar or snare and you will hear the possibilities. These feedback loops are the most sophisticated I have ever seen. And as if this wasn’t enough, there are 4 plugin slots for each feedback loop. Therefore, in addition to the 4 plugins on the input, and the 32 in the Pattern Designer, you have an additional 2 sets of 4 for each of the 2 feedback loops. I think this takes us up to a cool 40 plugins that Late Replies can be running inside itself. You can even put Late Replies to run inside each of those slots giving a total of 1,600 plugins – but of course, your computer will kill you for doing that. And please don’t ask me about putting more Late Replies inside the Late Replies that are inserted into the first Late Replies – actually, I’ll tell you - 64,000 plugins. The Feedback section flows into the output or Post FX stage where you can, you guessed it, add an additional 4 effects bringing the final tally to 48 effects. Now, it is worth mentioning that if you do not own a single plugin, Late Replies offers 35 built-in FX that are included. You will always have something to play with – and by the way, many of these are excellent sounding effects. Hard-wired into the output is a “stereo widening” tool that can accentuate the ‘spread’ of the delays. Finally, a ducking section allows for side-chaining that ends in a Limiter to keep the output volume in check. If you just take time to cycle through the 681 presets in this beast, you will hear a stunning, breath-taking, wide palette of time-based effects. They range from the subtle and smooth all the way to the dangerous and scary. Major kudos to the folks who programmed these presets – they sound great. The plugin sounds great as a result. The secret is in the flexibility which allows pinpoint adjustment of the delay to the detail that you want. If you are in a rush, you can get what you want. If you are seeking unique perfection and have time, Late Replies can deliver more than any other delay period. If you are a meticulous tweakaholic, then starting with one of the presets and making fine adjustments is the key. You can also just lock it to the sequencer clock and start from scratch one tap at a time until you have just the right amount of subtlety or mayhem you desire. But for sure, no one will complain about the sound of this plugin. Who Is Late Replies For? Late Replies is for Music Producers. Every Producer uses delay. This tool allows for the creation of the perfect delay needed for each track on the song. 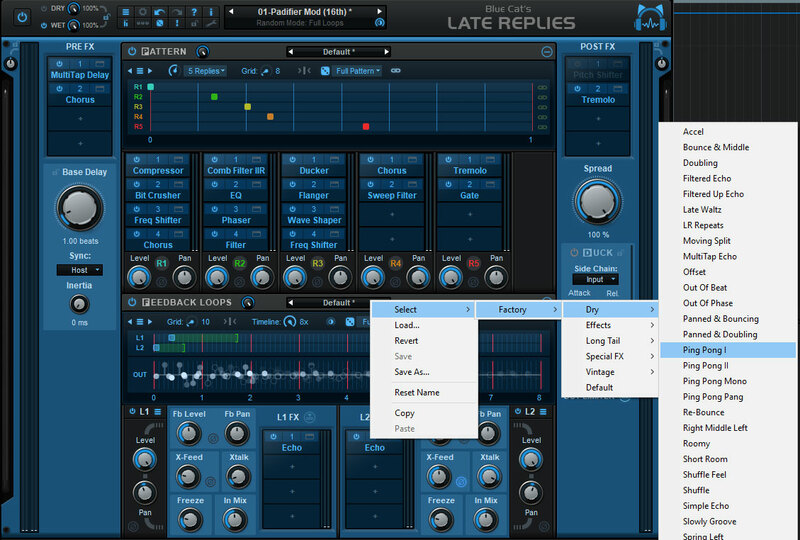 It also allows a producer to build up a library of delay textures that can be recalled at the touch of a button. Mixing Engineers is another group who can’t afford to be without this. 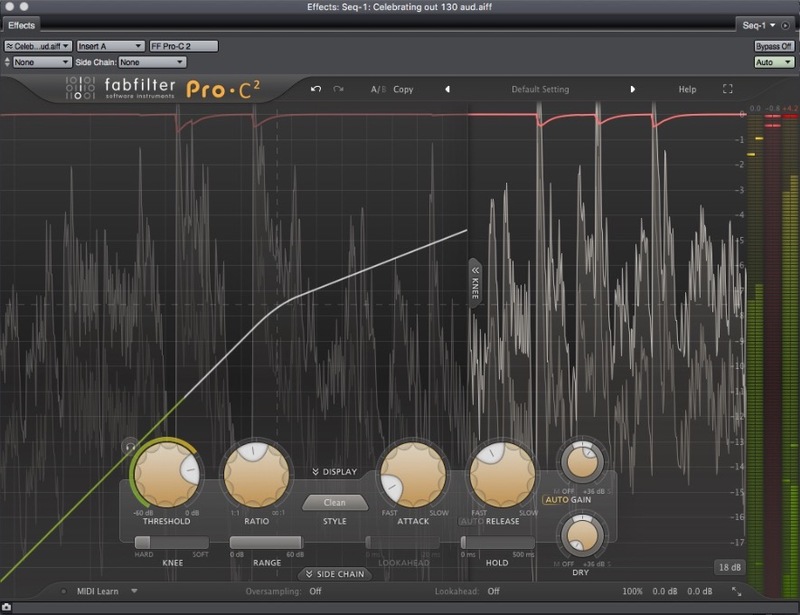 The level of detail, the depth of stacking plugins inside of plugins can deliver a sonic space all your own. The ducking controls and built-in Limiter means fewer loudness worries. Sound Designers can use Late Replies to make otherworldly sounds, especially for film and post work. If you want to hear what it was like when a T-Rex howled in the Valley of Desolation, of what King Kong’s footsteps sounded like when he crashed onto 34th Street, Late Replies and let you design the ambiances that make us believe we are there. Guitar Players would love this because no one likes to stack effects more than them. Here you can stack up to 48 pedals all at once in the most mondo delay sound ever heard. And you can store it to recall the setup with a program change. Film Composers are another group who need Late Replies because this effect can be so influential on a piece of music that it can take a score as far down the effect spectrum as the composer and scene require. With more and more scoring fuses with effects, this is the perfect vehicle. For general use, anyone working with Vocal, Guitars, Sound Effects and Loops can use this to enhance or disembowel these sound to the nth degree. Late Replies sells for $129 – which is less than the cost of a Boss DD-3 pedal [$139.00]. At this price, it is a steal due to the enormous power under the hood. There is simply no delay out there like this one. As far as competitors, most of the plugins on the market are regular, normal tools that process internally. They do not have inserts for 3rd party plugins or built-in FX other and simple modulation and reverb systems. There is one from another French company that is close but it does not support VST plugins. So at this time, Late Replies is all on its own at the pinnacle of the delay world. Built in FX allow sharing of Presets. Good for folks without many plugins. An educator who works in the Music Department of York University. She is a singer, pianist, and lover of classical and jazz music. She has been active in the music technology field for over 15 years and has worked with a diverse set of artists in Canada and the USA and film and TV production.